Fossil identification can be a challenging proposition. Often a small detail is all that seperates one species from another. Still overall classification system is not so difficult to understand. Fossils of animals are classified, as are living specimens, by observing the body structures and functions. While there are a few unique challenges in classifying fossils, the basic scheme of organization is the same. Going one step at a time can make fossil identification possible for anyone. Biological classification systems have a long history. Aristotle, working in ancient Greece, sought to classify animals by comparing the essence of the species. His system was a detailed system that included descriptions of the body. He believed that all species related to earth, air , fire, and water and classified accordingly..
More than a few centuries later, Carolus Linnaeus created another organizational system. His system was hierarchical, with increasingly detailed separations among members of the groups. Today, scientists use more or less the same system. Living organisms are grouped according to their similar characteristics. Therefore, animals are in a group separate from plants, separate from bacteria, etc. Breaking down the animal kingdom, the phylum level attempts to put animals into broad categories of similar body types. Phylum Porifera contains animals whose bodies are a collection of cells that loosely come together and are filled with many openings or pores. An example of this is the sponge. 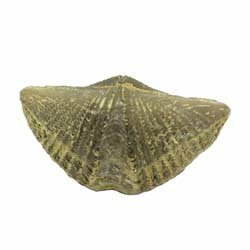 Phylum Mollusca all have soft bodies, no internal skeleton, and, often, are able to make shells. Phylum Echinodermata all have shells with a bumpy surface, or “spiny skin” as their name implies. Subsequent groupings are formed on the same basis: similarity of features, even when the features are minute or on a chemical level. Getting back to fossil identification…fossils belong to the same groups as modern-day animals. 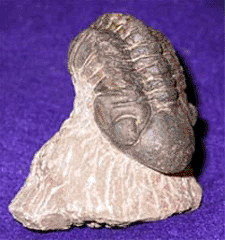 A Trilobite had an exoskeleton, jointed appendages (legs primarily) and a body that had distinct sections. All these features make it a member of the Phylum Arthropoda. The crinoid looked like a delicate plant with a “flower” at the end of a long stalk. But the stalk and the flower, were actually an animal that had bumpy skin—so it fits into the Phylum Echinodermata. Paleontologists look at minute details to determine further fossil identification and classification. With the trilobites, they consider the construction of their eyes, the variation in the segments of the body, the quality of the exoskeleton-whether it has a smooth surface or rough-the presence of antennae, and even the internal organs! Definitely a job for experts, but with a little practice, you will begin to call them by smaller group names such as Phacops or Agnosta! Do you have a fossil that you want to know more about? Submit a photo to our website. We will publish your photo and do our best to identify it for you. Tell us a name for your specimen. Just some details here, size, where you found your specimen, what ever you want us to know about this fossil. Your description will appear on a Web page exactly the way you enter it here, with your photo. Visitors as well as our staff will give you information about your fossil find. Here are some recent submissions we have identified. Click below to see fossils from our visitors. Found in Michigan,at sand gravel pit. This is an aerial view of a place known as "the fossil pits" in saint Clair , Pa. Schuylkill county. Its approximately 134 ft in length. What could this be? Should I tumble it? Found in mud from land slip on the beach in cayton bay North Yorkshire uk. I found it snorkeling in Aruba and would like to know what it is. Found this in a dry river bed in southern Alberta near Bragg Creek. Unsure what this might be and need help to identify it. About 5 inches wide. It looks like it has a second, asymmetrical set of teeth in front of the throat. Couldn't find anything remotely similar online. Found this in back yard in south, central michigan. Not sure if fossil or not. Heavy at about 33.5 lbs and about a foot across. Not magnetic. hymettus mountain fossil. Athens, Greece. All we know is it came from the Yukon near a goldmine trailing pond. Found in a bunch of road crush out front of my house in Alberta. Looks like a coprolite but the folds look to0 regular and look like gills. My dad found this in a gravel pit. I found this in Brookpark, Ohio, USA. Just sitting on the surface in a yard. They all seem to be the same kind of fish. Found in Sussex, Fairlight beach. Please identify this for me. I'm trying to identify all !y fossils and I'm having trouble with this if you know the type I will be really happy. While digging a post hole in the back yard for a deck. We found this. Don't know what it is but looks pretty interesting. On the surface of a limestone patio - picture scale is with the plant extending by ~ 40cm. I have no idea what it is, please help? It was found on a beach in Cape Town, South Africa. Pic one. 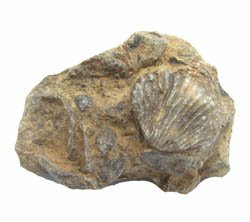 Type of Brachiopod. Pic 2 and 3. No clue. My late brother had this piece in his studio. I have no information on it. I found this on the beach in Jacksonville, North Carolina. I need help identifying this! On my job site they are digging and I found a lot of that specimen. What kind of invertebrates aré those. I found it on the beach in The Hague, Netherlands. I would love to know what it is ? A gastropod or perhaps an nautilus? Found on rocky beach in Anguilla, BVI. Jaw bone? Tentacle? Found it one day working . I was in the creek looking for cool rocks and I found this, I have no clue what it is and was wondering if it might be a fossil. Found on river bank, not sure what it is. I found this strange object in a crawlspace, I picked it up washed it off and still have no idea ,pls help was conyers ga house near a lake. Hiking in VOF State Park NV March 2017. Found lying on top of slickrock sandstone. fossil or a Turtle maybe embedded in lava rock? Found in Northern Arkansas near Bull Shoals Lake borders on a mountain top area. The area is private land and is not populated. found a rock in Wyoming with a black line going down the middle. I broke the rock and out popped the toe. Found in Qingdao, Shandong Province, China, in a coal heap. Only some fragments preserved of coal, and the fossil is a light yellow-green. Found in Robin Hoods Bay, Yorkshire. Wondering if they are parts of an ammolite maybe? I found this on the shore of Lake Michigan. I'm wondering what it is and what the silver inside could be. "San" as i call her is 47" long. Weight is approximately 75-100 pounds. I have no idea where it came from or what it is. I found a rock while digging. After cleaning with vinegar a small fossil appeared. Do you know what it is? Hard as a rock found around delta ut. Broke open big peace of clay 200' down at the bottom of a cliff in the cliff.in Utah.thin like paper it's not as leaf ?????? Found in 1973 on Wrightsville Beach NC. More rock than bone. 14" long and at the widest part 2.5". Found in Lake Ozark missouri on a hill top with other large rock formations. small fragment on a rock found on Saltdean beach, southeast England. another odd find unsure with this one . SENDING SIDE VIEW MAY GIVE MORE DETAIL RE SUBMITTING. Found in a washout in SW Indiana. Approximately 40 min. NE of Evansville. found this one quite a few years ago figured maybe a type of brachiopod? had this one since childhood never new what it was. found with various other small bone like fossils it resembles a small face of some creature with blueish and green colouration in it. another hill side find it resembles a reptilian like look with the leg and claw with scale texture. found while fishing with the kids we always look for unusual shapes in the shore lines.this one was alone no other types of bone like shapes around. found while digging a fire pit with various other pieces. Found out that we were swimming in lake Wilson, Wilson Kansas when this was found. sandstone. Found this outside of Riyadh, Saudi Arabia in the early 80's. I found it in the clackamas river in Oregon. That's all I know about it. Bought a box of rocks and found it in box. It's about the size of the Palm of your hand. I would love to find out what kind of stone it is. My father found this in Warsaw Kentucky, we are struggling to identify this creature. We are not sure. I think possibly an egg ? This was located on a shingle beach at Seaford East Sussex today. There are some great website for viewing photos of the different species. Here are just a couple that show off many different types from the same order:Per Hansson has a fabulous collection of trilobite pictures and try Geoscience Enterprises for fossil identification of crinoids. Of course, there are lots of books that will help you with fossil identification of your favorite fossil. These are some that we use. I recommend them because they are easy to read, inexpensive, and they are readily available. 1. Simon & Schuster's Guide to Fossils. 2. Field Guide to North American Fossils from the Audubon Society. Armed with some great resources and your growing interest, you’ll be impressing your friends as you introduce them to your collection’s specimens by name. Be careful, though, they just might think you need to find some modern animal friends to keep you company! Do you have a fossil question? Send us a note. If we can help we will. We wii never make your personal information available to anyone for any reason.